*Available in Best Case Bankruptcy and CINcompass for a Preferred and Premium Report. Account and Balance Details – See the status of an account, the amount due and details about when and how often it is used. Payment Details – Review the monthly payment, past due amounts and pay history for the last 12 months. Bankruptcy Specific Addresses – Access bankruptcy-department addresses to ensure delivery of notices. Owner Source & Attribution – Quickly identify the owner of the account and the reporting bureau. NOTE: A credit bureau mandated site visit may be required. Get more information. Gain a direct connection to credit bureau data to satisfy bankruptcy due diligence requirements. CIN Legal has been working closely with the bureaus for more than 14 years to provide a streamlined process for delivering this information to attorneys. Gain instant access to background information to deliver a complete picture of your clients’ history. 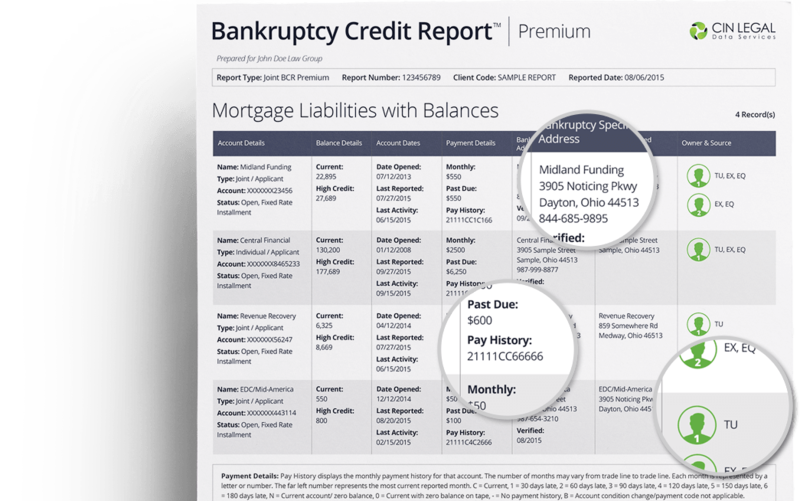 Powered by LexisNexis Risk Solutions, the industry leader in public records, get peace of mind that you know about any prior bankruptcies, judgments and liens. Receive current and predictive post-bankruptcy credit scores based on advanced statistical techniques and sophisticated analytical methods. Give your clients a peek into their future and show them filing for bankruptcy can increase their credit score. CINgroup® provides innovative software and due diligence products for attorneys practicing bankruptcy and their clients. Serving customers nationwide, the CINgroup family includes Best Case® Bankruptcy, CINcompass®, CIN Legal Data Services® and myHorizon™.